DIY Halloween Game - Glowing Ghost! 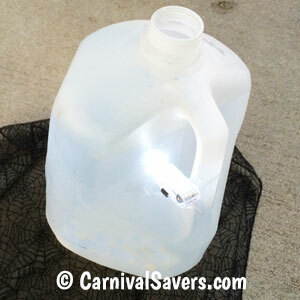 DIY Halloween Game Idea: Glowing Ghost! Tape Mini Bright Lights on the Back Handle of Each Jug. So Fun for an Evening Halloween Game! 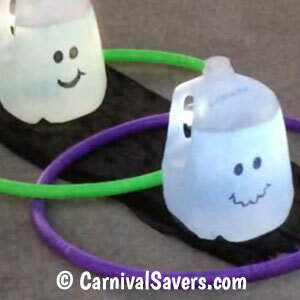 Before the carnival, wash out your milk jugs, remove the labels and and give each "ghost" a different personality. Next, choosing just the white lights, secure one light behind each jug (attaching to the bottom of the handle and facing the light to the inside of the milk jug) using the packing tape. Now you have glowing ghosts and they are ready for your kids Halloween game!! Next, place your Glowing Ghosts in a line allowing about 1 1/2 - 2 feet inbetween each ghost. Finally, set up your "stand behind" line(s). Remember, younger players should be able to stand closer to the first ghost to "even the playing field". 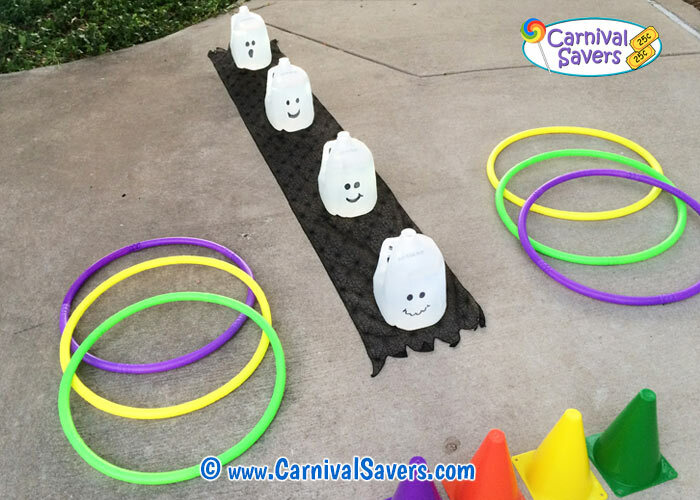 In setting up your game, make sure the ghosts are far enough apart so that the hula hoops can go around each one - so leave about 1 1/2 feet in between each ghost! Players are given 4 small hula hoops with a chance to hoop each ghost in order - starting with the closest ghost! If they miss the first ghost, they need to "catch" the first ghost first before trying for the others! If players "catch" all for ghosts in order, they receive a top prize. If they "catch" 2 or 3 ghosts they receive a middle prize. For one or less ghosts, they receive a consolation prize. This game looks fabulous at dusk or darker as the mini lights are bright and make the ghosts appear white and glowing! Be sure to have other lights around if your Halloween party is at night, so the children do not trip. Note: Use lights that are a true "white" or the ghosts will look yellow! AWESOME PRIZES & SUPPLIES for HALLOWEEN GAME - GLOWING GHOST!